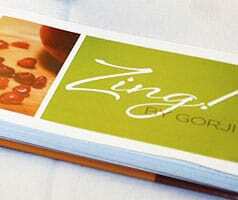 “I seldom use batters, coatings or rubs because I want the main ingredient to be recognizable and naturally flavorful. “In most instances, I grill, roast or sauté meat, poultry, seafood and vegetables by brushing them only with olive oil, salt and pepper first. Gorji also provides his personal list of favorite ingredients that comprise his essential building blocks of flavor—such as pure olive oil and limes—that he cooks with. His “New Mediterranean” culinary stylings, featured at his intimate Dallas restaurant, have been garnering critical acclaim for over a decade, he even earned the coveted “Texas Steak Cook-Off Champion“ award for his take on steak that incorporates pomegranates. In a recent interview, Edible Dallas & Fort Worth Magazine highlighted his Quail Breast, honey and barberries recipe. Dallas EATER featured a photo layout of the cookbook describing a sampling of recipes. No Replies to "To Foodies With "Zing!" 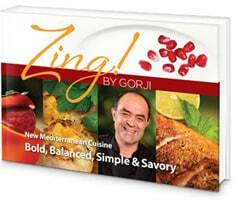 Dallas' Chef Gorji Announces Debut Cookbook"